See if it's something you'd like to join! Send us e-mail or regular mail. Let us know you were here. Introduce yourself. Tell us what you think of this web site or this organization. Look at what others have said. Splish-Splash: West Virginia white water excursion was a raft of fun for the many Fan 50 members who attended. Can you pick out the four Fan 50 dare-devils in this photo? The kayak adventure at Lake Oswego, near Chatsworth, NJ, pleased everyone who attended. Here, members Marge and Pat take a moment to enjoy the natural surroundings of their first destination - the shore on the far side of Lake Oswego. 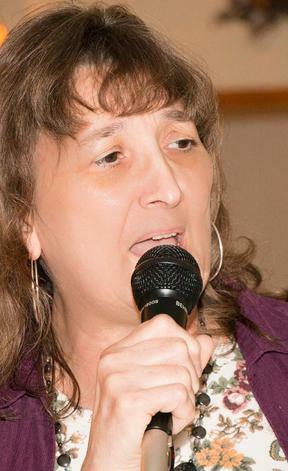 A special treat: Relatively quiet, artistic Carol surprised us all with a perky performance at the karaoke social. Nice work, Carol! 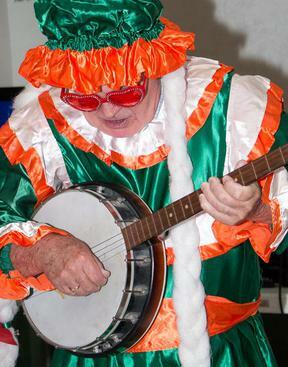 Mystery banjoist (OK Tom Cusack) made an appearance at a recent karaoke night. His costuming and antics brought the house down with laughter as he play a single note "song" on an actual real banjo!. Day Before Labor Day picnic social featured lots of activities, socializing and good clean outdoor fun. Three (of many) of the volunteers who help make the event work posed at the registration table: Harriet, Pete and Mary. In our first bird watching outing, Donna peers at a fishing Osprey, one of many New Jersey feathered flyers and perchers as a group of six of us trudged through snow and ice to get our views. OK, it wasn't really that bad. After all, the temperature was above freezing! "Antique Road Show" - Another favorite event is our version of the "Antiques Road Show" made popular by PBS. In our version, Fan 50 members bring older, possibly valuable, items from their homes and place them on a display table. Members then socialize and enjoy tasty appetizers and other refreshments. Meanwhile, the expert antique appraiser, Bruce, and business owner, Dennis, from antique shops “Aged To Perfection Antique Warehouse” and “Blended Eras Antiques” examine these potentially hidden treasures.